In today's society we have tried everything: science and spirituality, communism and capitalism... Nothing seems conclusive, and happiness appears far from us. The answer can in fact be found in the foundation of our beings, the Kototama Principle. Mikoto Masahilo Nakazono dedicated his life to this priciple, which has been hidden for over ten thousand years. "The ancient Celts told me that in the future the current of our society will make a complete turnaround. We will steer ourselves away from our course of the last eight thousand years and return to the principle of life." 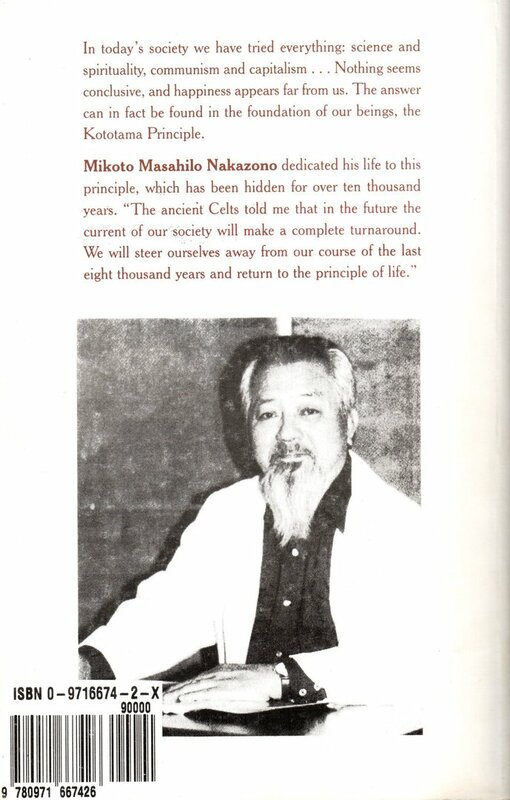 Written by Mikoto Masahilo Nakazono, master healer. The most current explanation of the Kototama Principle and revelations about ancient times. The origin of our present materialistic civilization (Amatsu Kanagi) is revealed in the ancient records of Japan. These documents have been presided over at the oldest shrine in Japan, Koso Kotai Jingu, by the Takeuchi chief priests for thousands of years. Excerpts from them are included within the pages of this book. They record the time when god-men began to hide the Kototama Principle from mankind. The god-men who perfected this practice were standing in a higher dimension – they had a complete, direct knowledge of Kototama. They included emissaries who traveled the world and created great political centers, such as: China, East India, Egypt, Rome, Central America, and Greece, initiating the second civilization (Amatsu Kanagi). Now we are moving into the third civilization (Amatsu Futonolito). The time has come and the hidden secrets are being disclosed to this generation. The documents show that the totality of human capacity is achieved by practicing the fifty sound rhythms of Kototama. Sensei Nakazono studied directly under Senseis Sakai, Ueshiba and Ogasawara for many years, then shared the Kototama Principle with Europe, the United States, and Mexico. He revised his medical practice to follow this Principle, arriving at a 99% cure rate. My first book was a basic explanation of the Kototama Principle, written in Japanese language. The original title was "Kototama: the original principle of Hinomoto Kuni". Hinomoto Kuni was the name given in ancient times to the geographical area of the modern country of Japan. This book was published in English as "Inochi – The Book of Life". 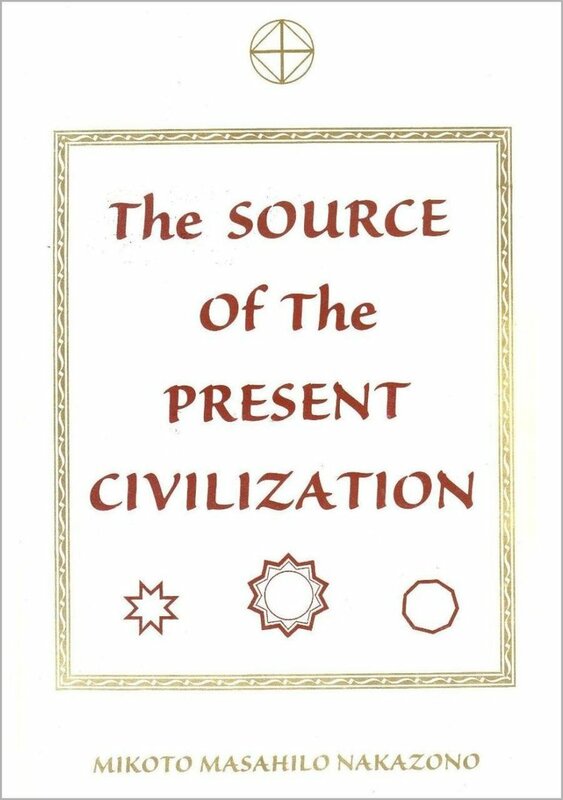 I think readers will find "The Source of the Present Civilization" much easier to understand. In this volume, I would like to talk about the original of our civilization according to the records and documents of Hinomoto Kuni. These records began to be hidden systematically about ten thousand years ago for reasons we will see in the following chapters. They belong to two distinct categories: the first deals with the Kototama Principle itself, the principle of human life, and the second with ancient world history. The two categories were hidden separately. As part of the treasure of the Koso Kotai Jingu, the oldest shrine of Japan, the world history records were entrusted to the care of the Takeuchi family. The Takeuchi have been the chief priests of the Koso Kotai Jingu for over 90 generations, and the hidden records of the shrine have come to be known as the Takeuchi documents. The original documents were written in the traditional Kami Yo letters on the skin of animals, on wood or bamboo supports, or even on paper made in that ancient time. No historical record, however carefully preserved, can ever be the exact truth. There are examples of tampering with history in every nation of the world. The strong leaders of our civilization have always cut or changed the record to suit their purposes or to justify their actions. In my opinion, the Takeuchi documents are a clear record or history only if you study them from the viewpoint of the Kototama Principle. In this book, I will follow the historical chronology of the ancient Takeuchi documents, reading them through my understanding of the Kototama Principle. I have studied and practiced Kototama for many years. I want to place the principle of life side by side with passages from the Old and New Testaments, and show the relationship between them. I want to show the truth of verses like: "Once upon a time, all the world spoke a single language and used the same words...". The aim of my research in this book has been to find the real meaning and to show the importance of phrases like these. It would be impossible to decript [sic][decrypt?] a book as long as the bible page by page. I will explain passages, as I understand them, to show how this and other sacred books can be studied from the viewpoint of the Kototama Principle and translated into their original meanings. The Bible, like all the books on which religions are based, is a symbolic representation of the principle of life; it explains how life manifests itself in the universe. In the present state of our civilization, the sky, the water, the earth are polluted. This is a direct result of the contents of our knowledge and the mistaken and confused idea we have of reality. If our viewpoint is confused, our society can only fall into chaos. Today, humanity expends all its energies for the satisfaction of its material desires. These desires in themselves are perfectly natural, but the way in which we gratify them is based on our knowledge and experience. Both are completely wrong. "I am hungry; I want to eat". Very well, but what? The answer will be dictated by habit, or by memory of a pleasurable experience. The question of health, or of what the body actually needs at that particular moment, doesn't arise. Or rather, if it arises, it will be in reference to others people's theories of what is "good for you". These theories, once again, will be based on this society's knowledge. We have no direct sense of what we should eat, decide, do at a given time. If individual pleasures is the first priority in the choices we make, it is easy to justify any crime. We have destroyed a great part of the natural resources of the earth in this search for comfort and pleasure. The original desire is pure. Our interpretation if it, through our family habits and through our education, is utterly wrong. To satisfy our desire however, we can only act upon the knowledge we have – our references, our values, our priorities. Desires of various kinds rule every aspect of our life. There physical desires and there are spiritual desires, just as there are five physical and five spiritual senses. I will come back to this, but for now I want to make this clear: to satisfy the desires of both sides of our capacity (physical and spiritual), we rely on our knowledge. If this knowledge is confuses, as it is in every aspect of society today, our actions will be wrong. A long time ago, our ancestors perfected a principle of truth, in perfect harmony with laws of life itself. I believe the time has come for us to return to this way. Guided by the spirit of our ancestors, I decided to write this book. I don't know how much it can help the suffering people of our society. I was content until now to study and practice the way of Kototama. I worked alone and suffered a long time before I began to understand the meaning of the Kototama Principle, and to compare its viewpoint with that of the present civilization. But I can no longer be quiet. There is too much pain everywhere, society has gone too far, and I must try to write what I know. This book is about the search for the source of life, and the way of returning to the source of our civilization. For these reasons, and because I am ordered to do it by our ancestors' spirit, I have decides today to write this book. The date is December 24 – Christmas Eve – of the year 1983, in Santa Fe, New Mexico.